Last Tuesday at 10 am I made a really quick last minute decision to head out of town. Pearl had finally come into heat and was able to meet her boyfriend. I had called my vet and he was kind of confused with my mare. She was supposed to have been in heat three days before that, but she wasn't. He wanted to see her, but I didn't want to wait one more day to take her to the vet. So, I made a real quick decision to hit the road. I arranged for Paw Paw to get Big Cowpoke from school and I put the other two in the car. I called Mr. Cowboy and told him I would meet him in town with the kids and we would leave to Fort Worth, Texas. Just a quick 8 hours away. We really love road trips. I had everyone packed and ready to go by noon. Even the horse! I was speed packing. I called the stallion owner, MSC Paints and told them that we were on our way. I was really excited to be going to Fort Worth. I have really only been to the Houston area of Texas. 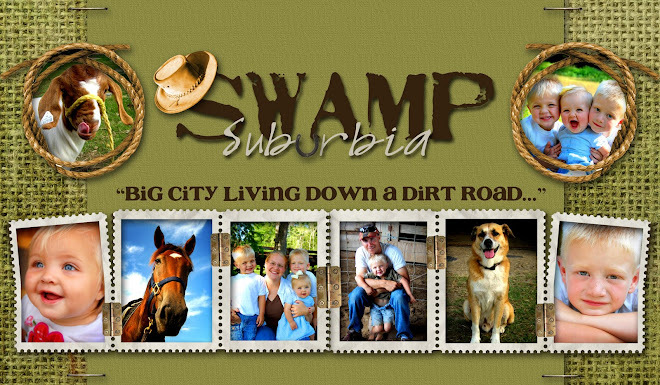 Which looks just like Louisiana. So, it was exciting to see a different part of Texas. The drive was long. But thank goodness for lots of cows to look at. Little Cowpoke loves cows. Also, thank goodness for the DVD player. I really like Texas. I love the rolling hills, the horses, the really nice big horse ranches, the open spaces, big trees, and the horses. I love how every Texan has Texas Pride. They are all so proud of their state. I was really impressed with this statue. I took this picture from the opposite side of the interstate while going about 75 miles per hour!! I was not driving, Mr. Cowboy was. 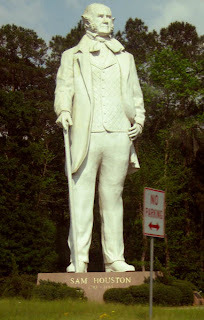 That huge statue is Sam Houston. He has a lot of parks! I really do not know what he did, but he has a city named after him, a lot of roads named after him, and a lot of parks named after him. He must have done something great. And I bet a lot of you are making fun of me right now because I do not know what Sam Houston did. I will Google his name later. Right now I am too tired. We arrived at 8 pm and we were all so very tired. We were going to just drop off Pearl and then leave to drive back home. But the ever so nice people who own the stud asked if we could stay with them. They were so very nice. I just love horse people! We stayed up late talking about horses. I think horses can be seriously addicting. I have dreamed about them for my whole life. As far back as I can remember. I always dreamed of having one. Now I have 7 of my own and 20 in the pasture that I take care of with my father in law! Any way. 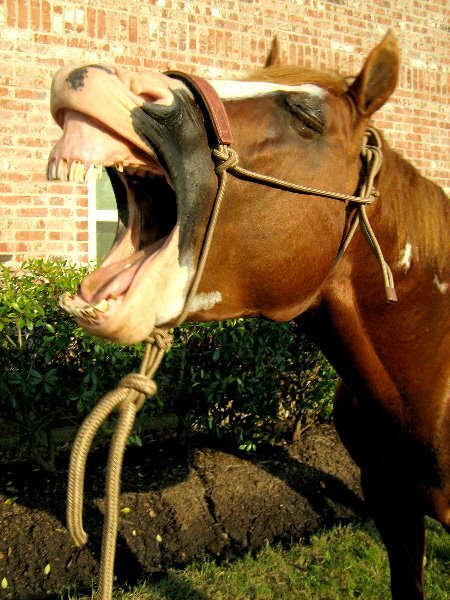 If you are a horse person and you meet another horse person, you can talk horses with them forever! But it was late and we all hit the sack around midnight. The next morning I got to go and see Pearl's boyfriend. He is a nice boy. Don't mind his dirt. He was having fun. He is enjoying his new found freedom. He had not been turned out and let to run for about 8 years. He was kept in a stall and then exercised on a hot walker. So, it is okay for him to be a bit dirty. 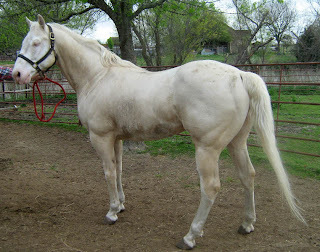 Plus you can never keep a light colored horse clean. 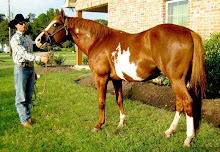 His name is Final Review and he is a Cremello paint stallion. 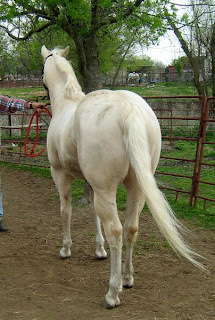 If bred to the right colored mare he will make buckskin and palomino colored paint babies. Neat huh? I am obsessed with large rear ends. I hope my baby has a rear like this one!!! There is another stud at MCS Paints too. His name is Cody. He is beautiful. I fell in love. He is for sale. But I was not aloud to take him home, said Mr. Cowboy. I would have taken him home too. He is gorgeous. 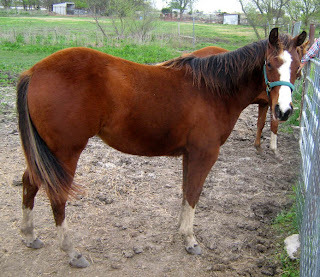 Here is one of his yearling babies. I wanted her too, but she wasn't for sale. Not that I could have bought her anyway, but I still wanted her. She is my favorite color. I am a sucker for a blood bay. But I am sure you are all sick of horse pictures. And you are all probably wishing I would find something else to talk about. Which I will so here. Here is what Little Cowpoke did for fun while I drooled over all of MCS Paints' horses. He found a cat and decided they were going to be friends. 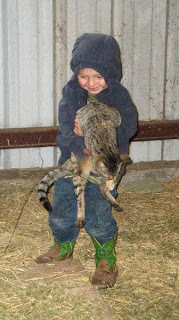 I don't think that Little Cowpoke has ever been able to hold a cat. This cat was so nice to Little Cowpoke. He held it by it's arm and it didn't complain. She also had kittens, which was a complete joy for Little Cowpoke. He would pick up two of the kittens at a time and say, "Awh baby, shhhhh baby it's okay." He is so sweet. Then he tried to put them all in a bucket. Silly boy. I think he really liked the cat. Little Cowpoke is such an animal lover. It makes me smile. I love animals too. I just sneeze when I am around them all. Cats exspecially. We had a great trip. That morning we all packed back in the truck and headed back south. We left Pearl at her boyfriend's house and planned on picking her back up the next weekend. It was a fun ride back. Little Cowpoke cried when we left Pearl. He did not want his horse to stay there. He is so sensitive. It's sweet. Look at those fine horsey rumpuses. Too bad that isn't all the rage for people too. I'd be the height of fashion! I love big butts too. What a turn on! I'll have to post a picture of my gal's boyfriend. His is huge! 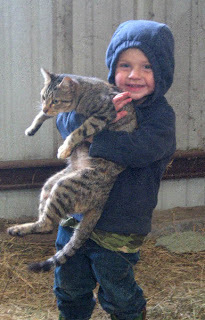 Your little man's 'kitty' looks just like my barn 'stud' Sly. And he LOVES to be carried aroubd too! Must be the grey cat, love me, thing. That story about Mac is crazy! 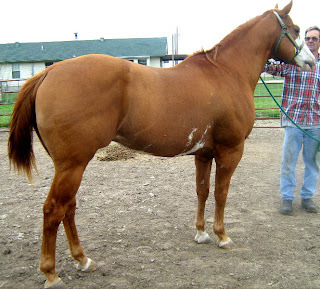 I'm looking to maybe sell my old mare to the right home and somebody local is coming to look at her for somebody in WYO, of all places, friday. Cash or certified check ONLY! That story totally freaked me out! I'm glad we do a lot more horse auctions here. Everything's in person...but still! Oh it's not my wedding, but my brother's...therefore I get NO say whatsoever. I'm way cheap. I'm all for boots.